Most of UTO’s sweaters are knitted in 12 gauge. 12 gauge means that there are 12 needles within a width of 1 inch (approx. 2.5 cm). When hand-knitting with needles, the gauge is probably about 5. Thick and low-gauge knitwear looks warm and luxurious, but it is more difficult to have a high gauge sweater knitted with even stitches, and the yarn quality shows. Our sweaters are known for their beautiful stitching. 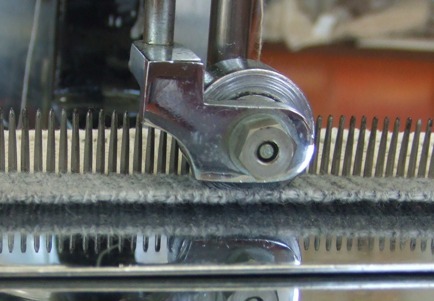 Knitting machines in Japan are usually 12, 10, 7, 5, or 3 gauge. 1.5 gauge is available, too. High gauges are 12 and 10, 7 and 5 are the middle, and anything smaller than 3 gauge is called “low-gauge” or “bulky.”　Different gauge machines are not mutually compatible, so we have to have separate devices for different gauges. 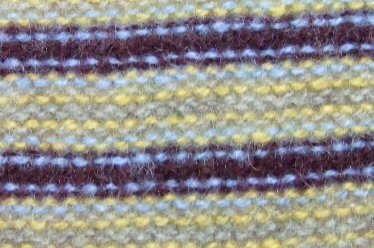 Linking is the process of joining side seams or edges of fabric pieces together with a row of knitting on a linking machine. It has to do be done by a person manually picking stitch per stitch on to the linking machine. The number of workers who can do this process in Japan is decreasing dramatically due to the transfer of manufacturing overseas. It is indeed an “endangered” skill. We are proud that there are many young craft workers in their 20s at our Kitakami factory. People in the knitting industry are surprised when they find out that linking is done by such young people.